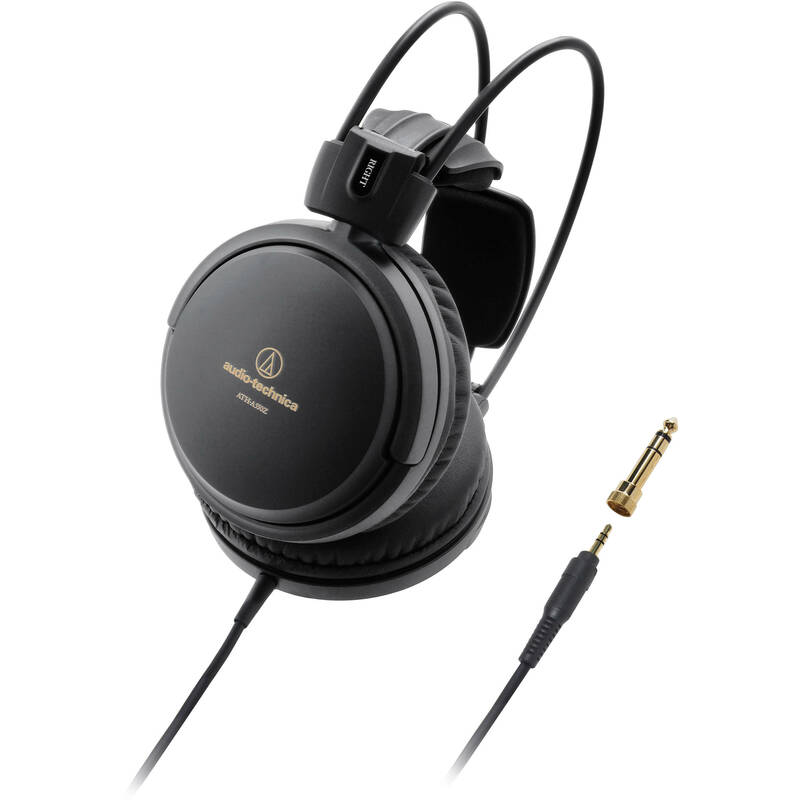 The ATH-A550Z Art Monitor from Audio-Technica are closed-back dynamic headphones with large-aperture 53mm drivers. Using CCAW bobbin-wound voice coils, it delivers audiophile-quality acoustic performance with linear frequency response in applications for studios, DJ's or listening with any device such as CD players, recorders, cameras, and more. Featuring a top-mounted PCB, which contributes to smoother airflow for precise diaphragm movement, the ATH-A550Z headphones have Audio-Technica's 3D wing-support system, aided by their soft and premium-grade earpads, which allow you to listen to audio for hours on end in comfort. An integrated 9.8' tangle-free, cloth-wrapped cable is also included with a 1/4" stereo adapter. Box Dimensions (LxWxH) 10.4 x 8.5 x 4.8"
ATH-A550Z Art Monitor Closed-Back Dynamic Headphones is rated 5.0 out of 5 by 3. Rated 5 out of 5 by Anonymous from Great Sound, Comfort, and Value To start, these were my first pair of real cans that weren't a gaming headset so keep that in mind while reading. From the minute you open the box you know what your getting with these. There are no frills or fancy packaging, just the headphones, with the 1/4' adapter included as well if you have an amp, DAC, or an audio interface with a 1/4 input. I'm not to big of a fan of the cable since it's somewhat rubberized but that's just a nitpick. The wing system is a love it or hate it thing. I personally enjoy it as it doesn't concentrate the pressure anywhere on your head. If the fit is too lose for you, its easy to put a rubber band between the wings to get the desired clamping force. If you have thick hair, the wings will leave impressions on top too so keep that in mind if you plan in wearing them for long periods at work or something like that. Sound wise I love them. Compared to my previous headsets - Logitech G933, HyperX Cloud 2, & PlayStation Elite Gold Headset - these sound fantastic. The bass can leave a little to be desired if you love heavy bass, but everything I've listened to sounds clear and sharp. The soundstage is great for games. In shooters like CS:GO and Overwatch you can hear everything around you perfectly. Moving to something like Dark Souls 3, you'll be completely immersed in every environment. For music use these can be a tad harsh to listen to for long periods at first however you'll get used to it pretty quick. I'm very happy with my first pair of true headphones from AT. The black and gold color scheme is muted enough to fit in most setups and looks very clean. The wing system is fantastic in my opinion, and I'm not sure if you can beat these for the price. Overall these are a fantastic entry into the audiophile community without breaking the bank. Rated 5 out of 5 by Cmax from Solid Replacement for ATH-A700X These were a direct replacement for a pair of ath-a700x's that finally died on me. They strongly resemble the other high quality ATH studio monitors. They need a few hours to burn in, but are crisp, bright, clear, and fill out the sound stage with a pleasant mix of clarity and fullness. You can really hear the isolated instruments and the pauses and separation of everything. They are not super bassy but more balanced. Great product for the price. I mostly use them for gaming and music. Rated 5 out of 5 by David from Great Product This is the most comfortable set of headphones I have ever owned. You can wear these for hours and forget that they are on over your ears. No fatigue of any kind to report. Sound quality is ok not overly impressed by them, they have a huge frequency range and it pickes up every small error in a recording. Thease are good for reference in the mastering process, along with my other sets i own it will be used primarily as a mistake hunter. Not something I would use for a daily driver at all. I will give it credit for bass response, that was one thing that took me by suprise. Do not typically find the bass response like these have in this style of headphone. Overall build quality seems good. and not to many places as a potential failure point. I would reccomend the Manufacturer look at the detachable cord in future build updates.